A blog dedicated to the crafting of faux foodstuffs, casting & molding, and other nifty tricks for theater production. Not sure if it's a weird theater thing, but I have a LOT of friends that are Aries/Taurus/have Spring birthdays (myself included), so in honor of them, this FFFriday is a birthday cake! For a production of The Herd at Steppenwolf I was tasked with what is a pretty 'simple' food prop, it didn't need to do anything fancy, it just came out on a tray and no one touched it. 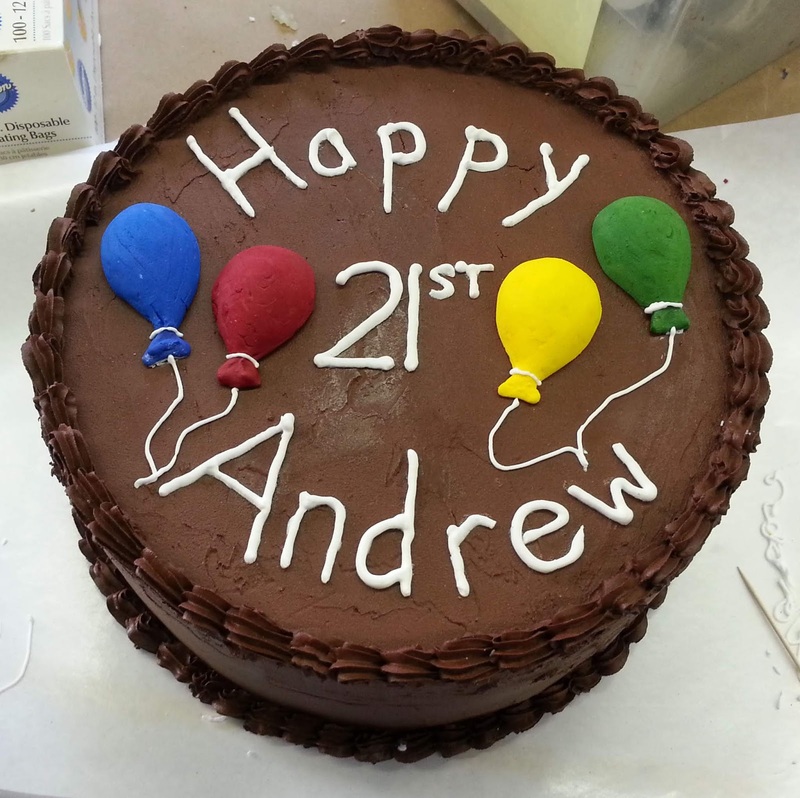 I was given 3 instructions: It's chocolate, it needs balloons and it needs to say "Happy 21st Andrew" on it. Unfortunately I didn't get any pre-frosting pictures, but I stacked two circles of insulation foam on top of each other and used FastBond Contact Adhesive to stick them together. 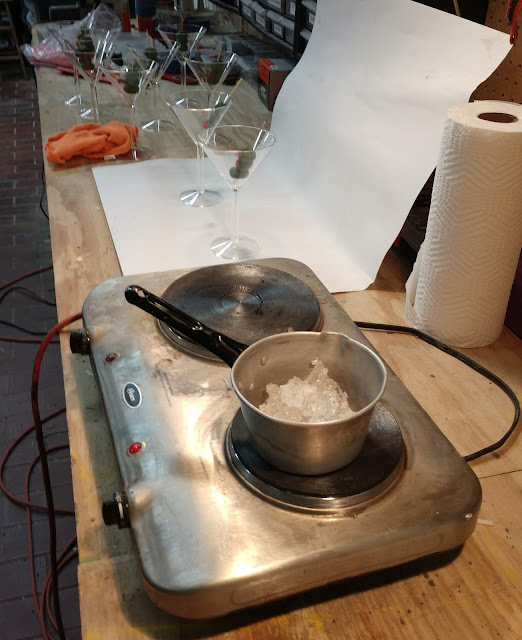 We didn't have our cake board (a cardboard or foil covered board that the cake sits on) yet, so I placed the cake onto a piece of wax paper to ice and pipe it, because the PermaIce doesn't stick to it. A note about PermaIce: It's awesome and no longer available... however it looks like Deco-Frost is a similar product. However, spackle or acrylic caulk are much more cost efficient materials to use as icing as seen in Cakes ala David and One Last Herring Cake. I tinted the PermaIce with acrylic paint and smeared it on with a spatula. I piped the edges using a star tip and had a TERRIBLE time because my PermaIce was... chunky (and old and a bit dried out) and kept getting stuck. For the words, I used straight PermaIce and piped it onto the wax paper, so if I messed up, I could scrape the icing back into the bag (also a good way to practice!). I let the letters fully dry and then glued them on with white glue. Cake balloons are usually solid icing, but I didn't want to attempt to pipe them, in the interest of time and effort. So I shaped them out of more insulation foam (after laying out how big they should be on this very fancy drawing I made). Can you see my piping lines? I then covered them in more PermaIce, tinted with more acrylic paints. 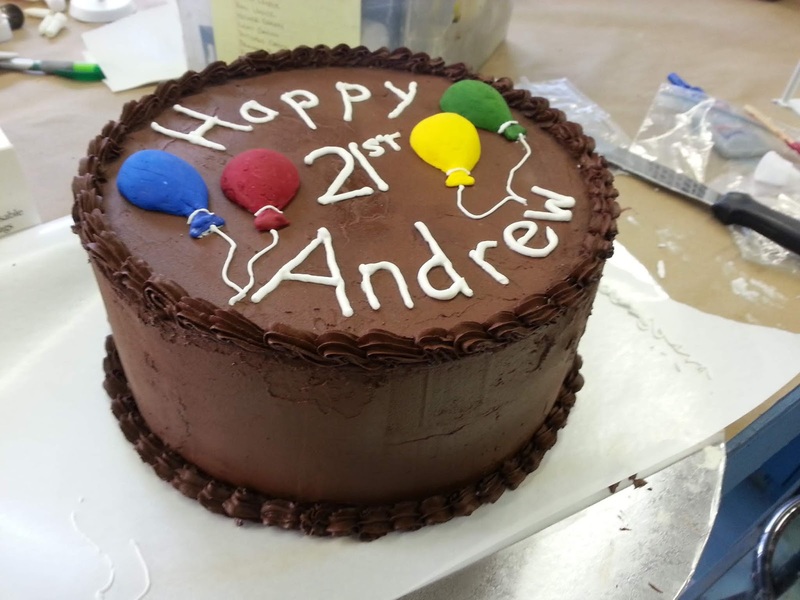 I did this on wax paper and transferred it to the cake, just like I did with the letters. 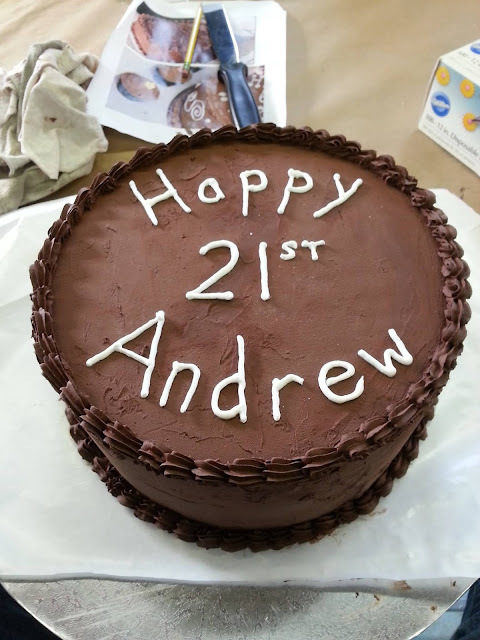 Because I had limited piping tips, I ended up using a small tip and 'filling in' the balloons, then smoothing it out before it dried. I also did a bit of sanding. Then I glued them down and added some tiny balloon strings. And there we have it! I glued it to the cake board using hot glue and far as I know, it's still fully intact sitting in storage to this day. Happy Birthday/ Unbirthday everyone! 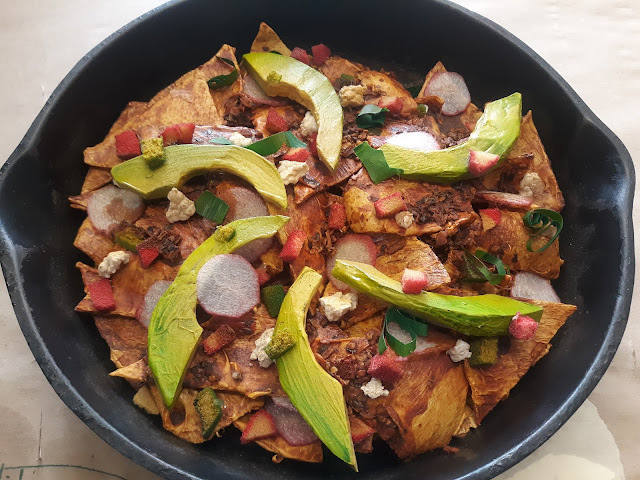 Conchas & Chilaquiles Faux-Mex - FFFriday Guest Post from Katie Webster! This week's guest post comes from the delightful Katie Webster at the Denver Center for the Performing Arts. I had the good fortune of working with Katie at the Santa Fe Opera! We had some delicious Mexican food to create for a production of American Mariachi at the Denver Center for the Performing Arts. 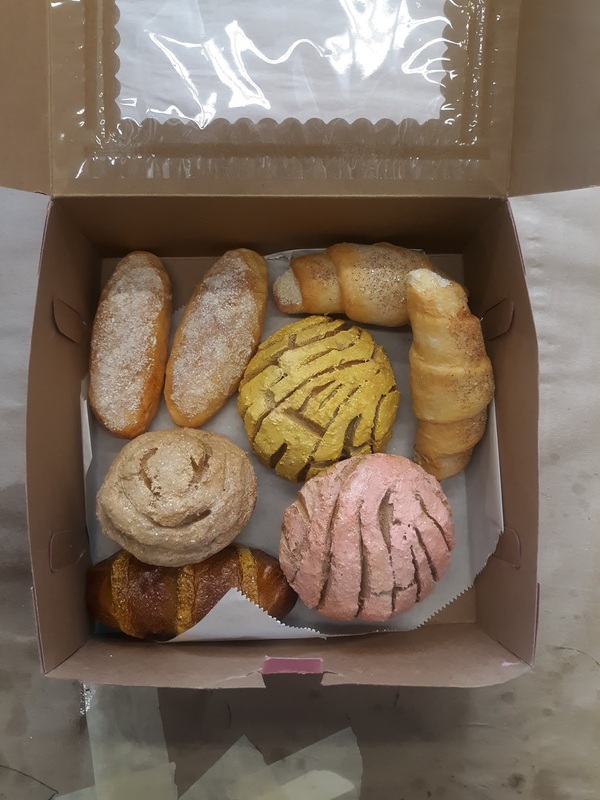 For this box of pan dulce, including the charming Conchas, everything started with upholstery foam scraps. 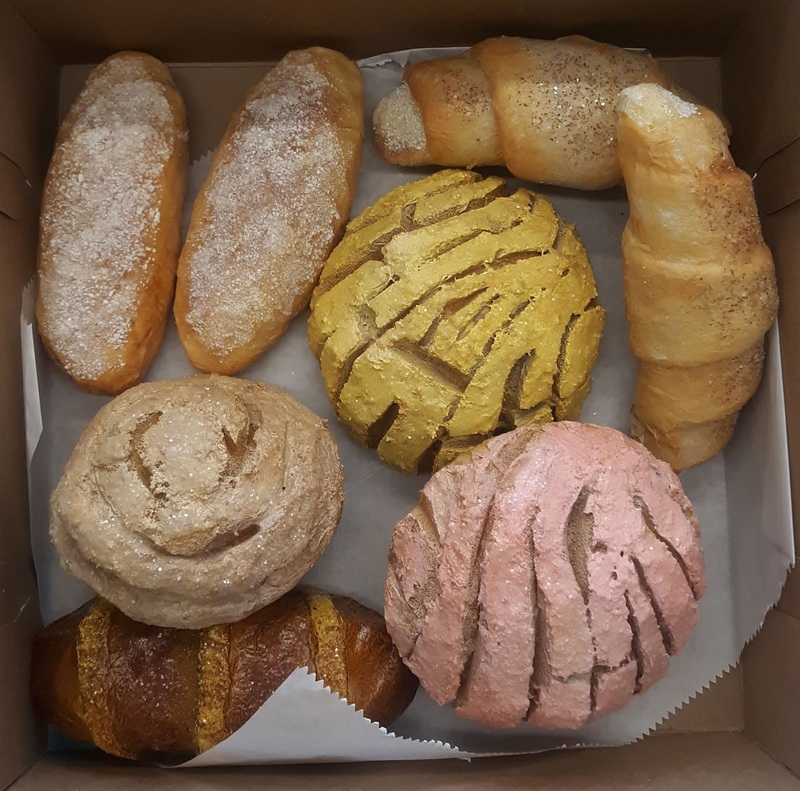 There are soooooooo many styles (have you seen the Elote ones---bread shaped like corn?) but the conchas are colorful and instantly recognizable. 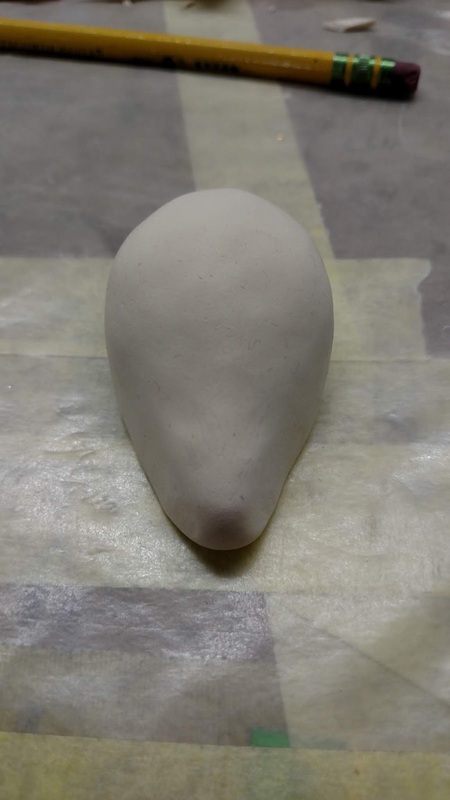 I sculpted the upholstery foam into a dome shaped bun. Then I scored the 'shell' pattern into it, maybe 1/4" deep. I sliced away selectively to mimic the cookie crumble topping that is on the conchas. A few years ago I learned to keep my blade oiled up when carving any type of foam! The Cuernas were shaped by cutting a triangle of 1/4" thin upholstery foam sheet, sprayed with Foam and Fabric adhesive, and then rolling up like you would a real crescent roll. Then I did a tissue paper layer ( I used Rosco Crystal Gel as the medium but white glue would do the trick). Next it came down to painting: they definitely got dusted with Design Master's Glossy Wood Tone. For the colorful 'toppings' I used some tube acrylic colors as they had a nice thickness. The finishing touch was a sprinkle of translucent glitter while wet to really capture the sugar coated look. 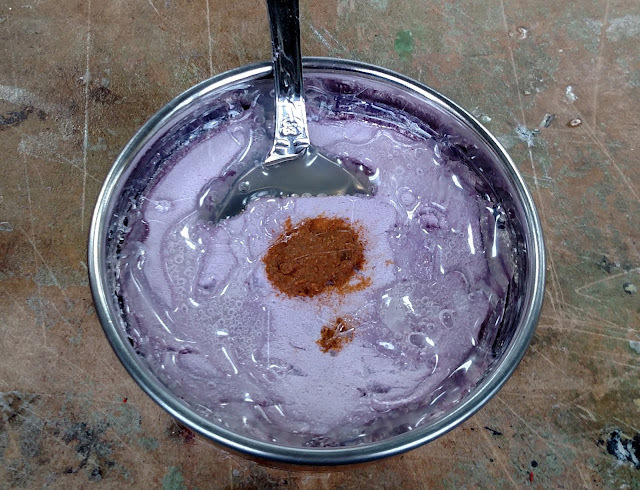 Cinnamon sugar was finely ground cork mixed with glitter, and the powdered sugar was a bit of styrofoam shaved off with a rasp. For the radishes, I cut circles of the foam and painted the edges red while I held them in a stack between thumb and forefinger. 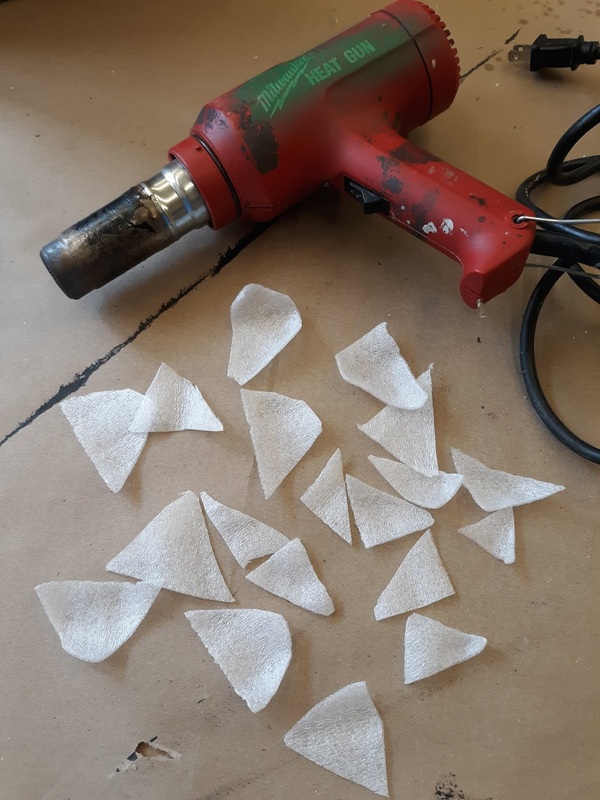 For the fried tortillas, I cut triangles of the same foam and then gently warmed them with a heat gun. (I tossed them all in a small cardboard box to do this, as they will blow around a lot!) 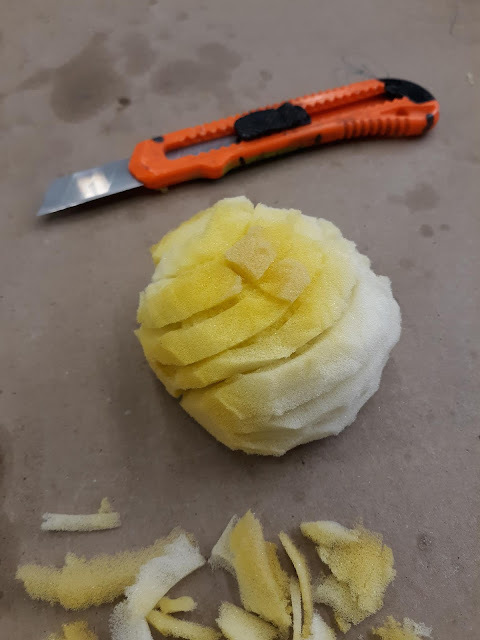 The heat gun melts them just enough to curl and round over the edges to look more like fried chips. The most time consuming part was the dry time of painting the chips, I tinted Rosco Crystal Gel a light yellow base color and painted each chip. 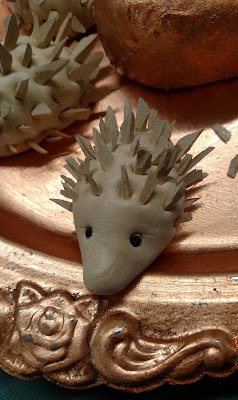 I let dry supported on toothpicks, and then I glazed them all with a wash of reddish brown. 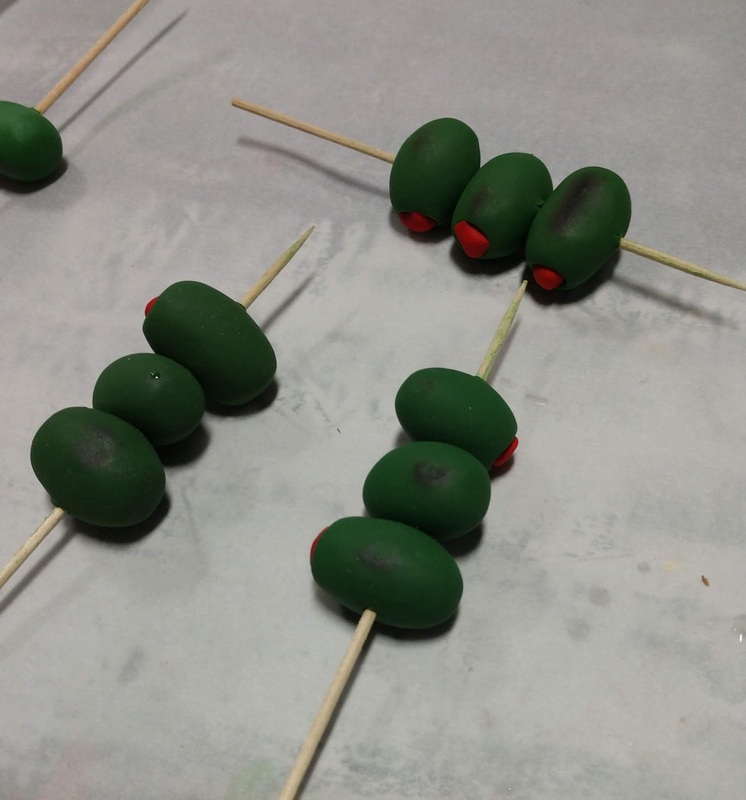 The garnishes were really fun as well, avocados carved from insulation foam and painted with tinted Crystal Gel. 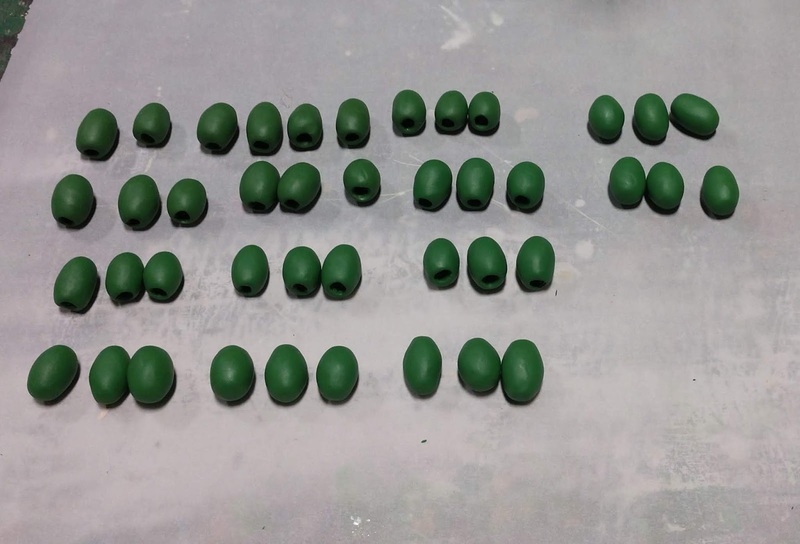 Wood shavings spray painted green for green onions. Crumbled styrofoam for cheese. 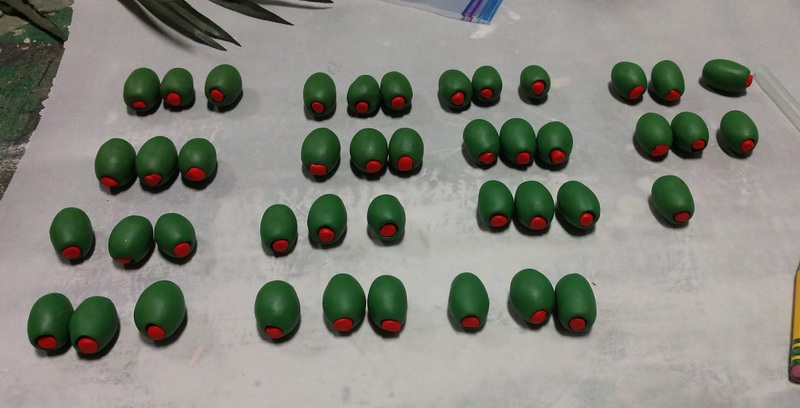 Small bits of upholstery foam spray painted red and green for tomato and jalapeño. I used some real Chile flakes as well to help my paint look more like sauce! Also, the real cast iron skillet helps complete the illusion. Thanks Katie! These look awesome and I would 100% like to eat it all. Katie is a part of INCITE Colorado and you can learn about them here! Happy Fake Food Friday everyone! It's time for part 2 of our revisit of Anna's Dirty Martinis! In part 1 I went over my olives, and now it's time for the fun part: The liquor! 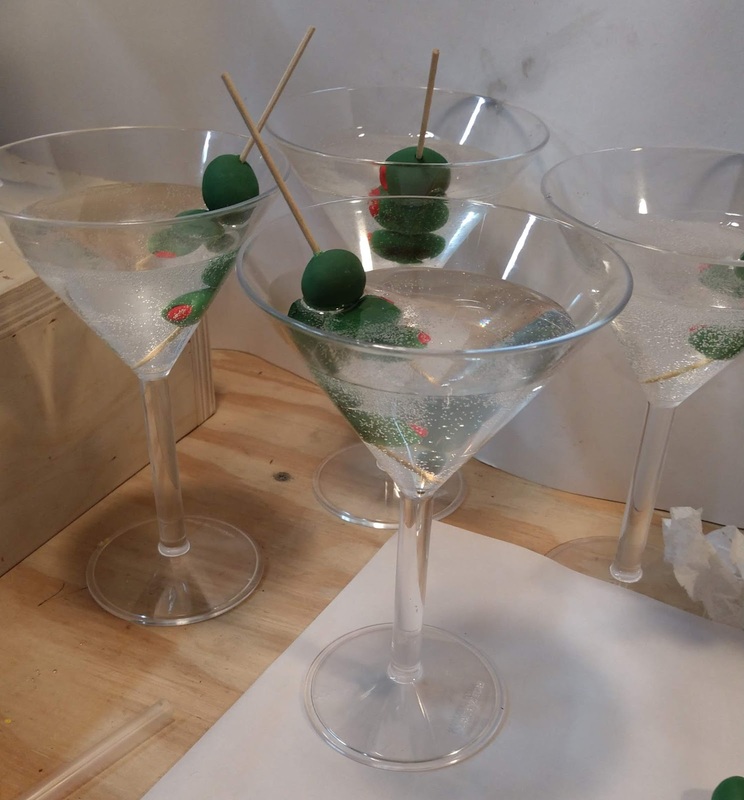 Anna used acrylic water for her martinis, but for ours I used one of my new favorite materials, gel wax! I'll be doing a Materials Monday on it because it is so nifty and has so many uses. In this project I used ArtMinds Gel Wax from Michaels. A quick run down of Gel Wax: it comes in a tub, and you can get it at pretty much any craft store in the candle making section. You can color it with wax dyes and you can heat it on a stove top. It's solid once it cools, so it's much quicker than the acrylic water. 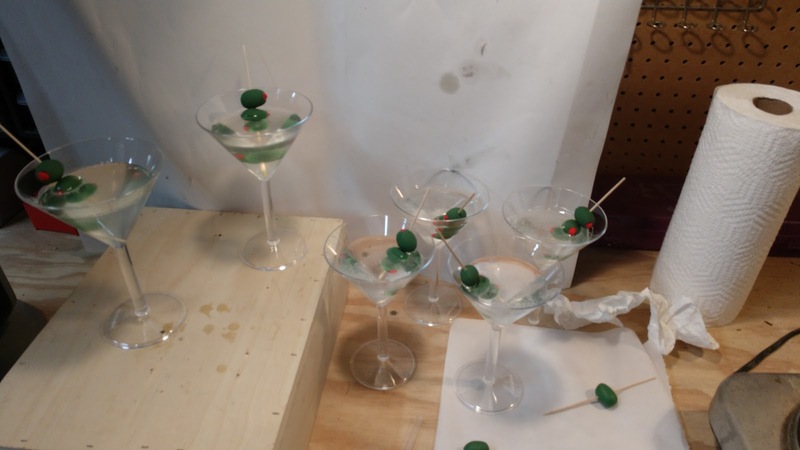 Because I didn't need to dye the martinis any color, I didn't bother to measure how much gel wax I was using. I just put a bunch in a pot and let it heat up. Because I wanted them to be as clear as possible, I made sure I heated the wax until all the bubbles were out and it was very liquidy. The big risk in this is if you're pouring into an acrylic vessel (as is the case most of the time for theater) is that it might melt. I didn't melt any glasses this time around, but I've definitely done so in the past (and will gladly share in my gel wax post). I also read that you want to make sure to use a metal stirrer, not wood, because wood can introduce bubbles into the wax. My skewers definitely did! The cool thing about gel wax is you can pour it in layers and not get stratified lines because the wax just melts into itself. These are my first two half pours. I noticed that I was getting bubbles, both from the wooden skewers and from the cool air. They became more pronounced as the wax cooled. Heat the wax, heat the glass! I tried to warm up my area and the glasses a bit with a space heater, and that did seem to help some. In the end, I couldn't get rid of my bubbles. 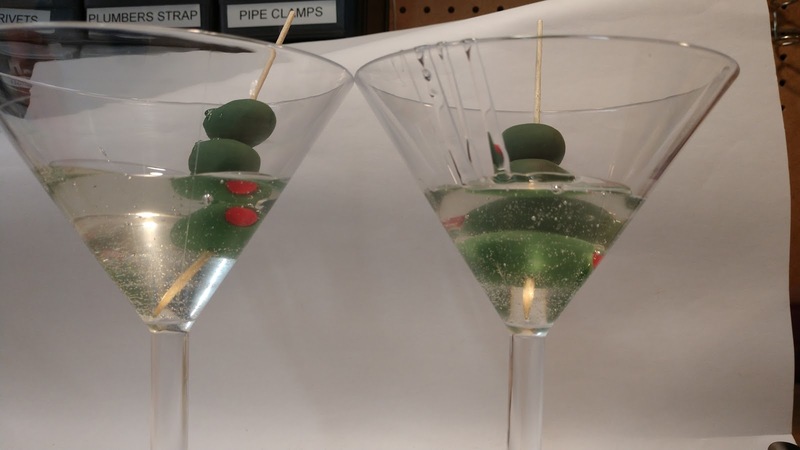 I did find that pouring the wax, then placing the olive skewer did help to make sure the wax got all the way around the olives, but bubbles still happened. This wasn't a huge problem for us, as our house size is huge, and the bubbles actually made it look like there was liquid in the glass. I never did get a shot of all of them together, as we were rushing to get these to rehearsal. I think they turned out pretty well, despite the bubbles. If I were to do it again, I'd probably seal the skewers and olives in hopes that they wouldn't cause as many bubbles, but I'd want to do a test to see if a spray sealer would react in any way with the wax. Shortly after this project, (and after I had finished this tub of wax), I did a round of champagne with a different brand, Country Lane Gel Wax from Hobby Lobby, which barely bubbled at all! 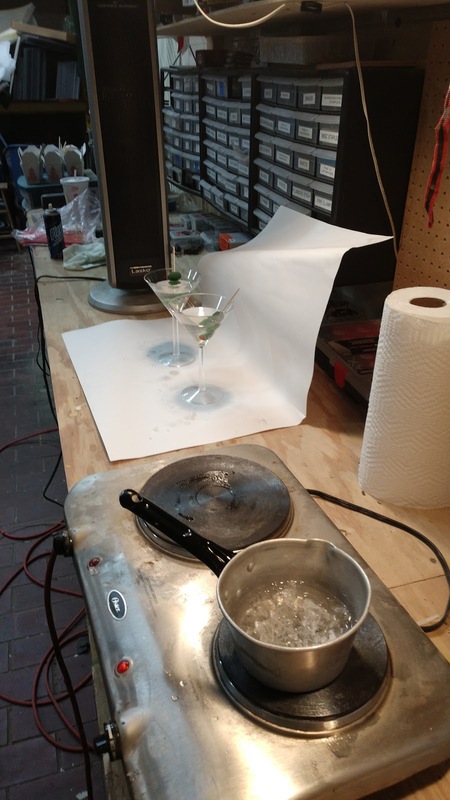 That was unfortunate for the champagne, but would have been perfect for these martinis! Ah, well, live and learn. 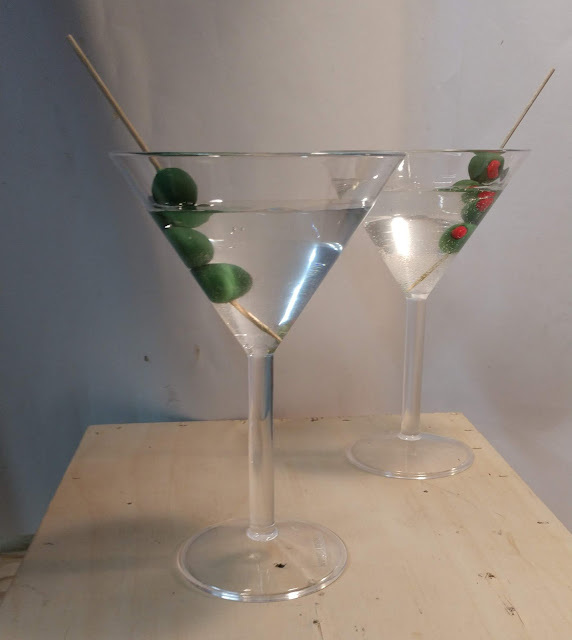 I'm not really a martini girl, so I can't say this project made me want one, but my summer boss Randy is a big fan, so I'm going to end this with a quote from him. "It's like a salad if you get it extra dirty"
Fake Food Friday - Pimento Stuffed Olives! It's that time of the week, y'all! For this week's Fake Food Friday, we're going to start a 2 part post looking back on Anna's Dirty Martinis. I used her process to start off, and made a few adjustments. She, too, improved up on her olives in this post, and my process was pretty similar. Due to the large house size, we opted for 3 olives per skewer. To make the pit hole, I used a straw and then gently reshaped the end. 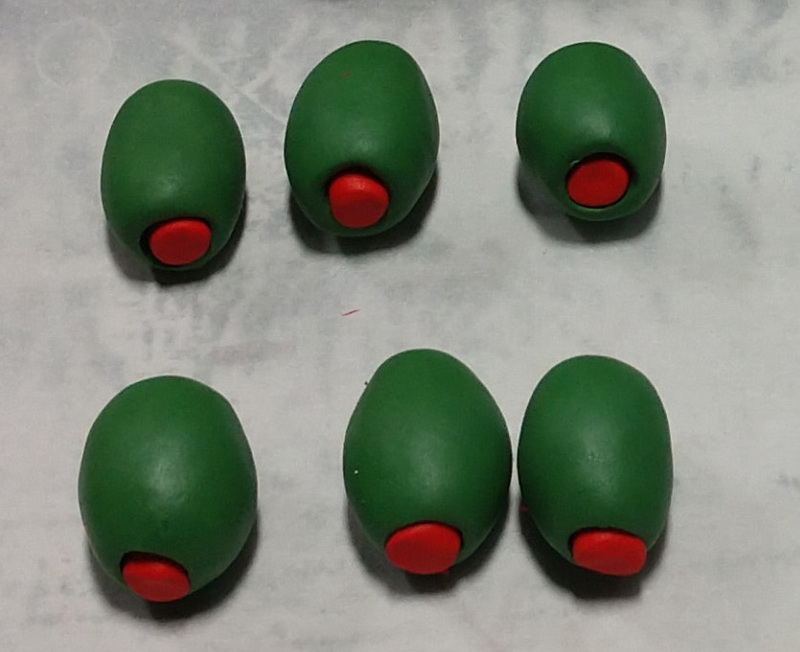 I found it was easier to do this after the olives had set a bit after I shaped them initially. If the Sculpey was too soft, the olive lost shape completely. The pimento is just a bit of red Sculpey. 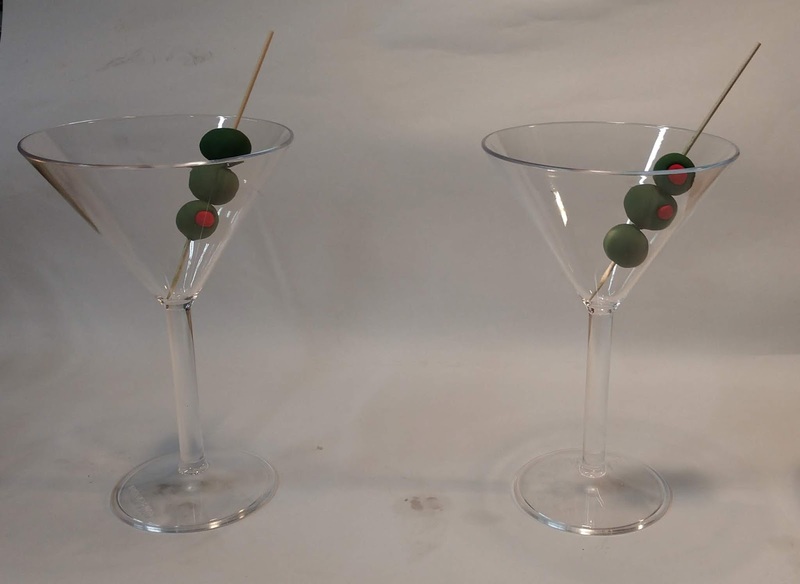 Apparently olives with pimento are also incorrect in a martini according to this blog. But green blobs wouldn't read in row FF, you know? 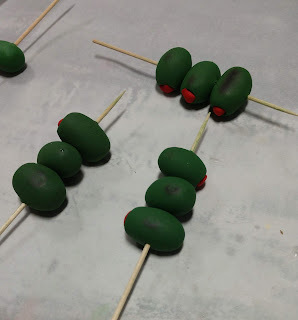 For the skewers, I needed something longer than traditional toothpicks, but we didn't have any cocktail spears that weren't plastic, and we learned from Anna's olives that plastic will melt in the oven. Thankfully we had some large cocktail umbrellas that we knew we wouldn't need in the next season and a half, so I harvested their sticks. Sorry umbrellas. I also soaked those mini skewers in water, much like one would do before grilling kebabs. 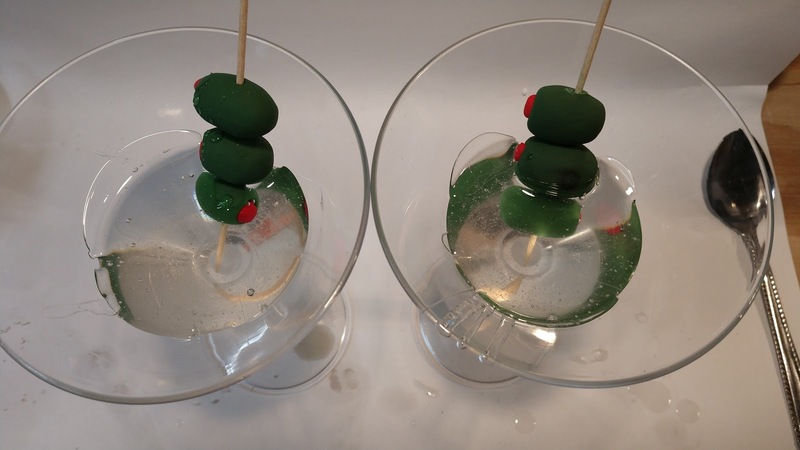 No one wants charred martini skewers! I made sure to line my tray with parchment paper so nothing would stick. 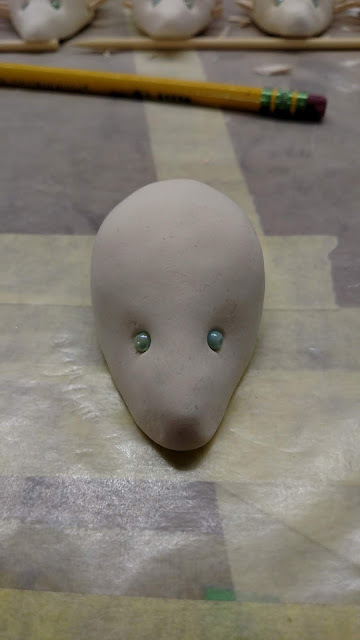 Sculpey III bake time is 15 min per 1/4in at 275°F . I opted for about 40 minutes as my olives were about 1" x 1/2". I should note that toaster ovens are not the most precise machines. Most Sculpey sites suggest using a oven thermometer to make sure your temperature is correct. I did not do that. As you can see, my toaster oven was a bit too hot, or I left them in a bit too long. From a distance you couldn't see the scorch marks, so I was more careful with round 2. Next week I'll cover the gin portion of our martinis! 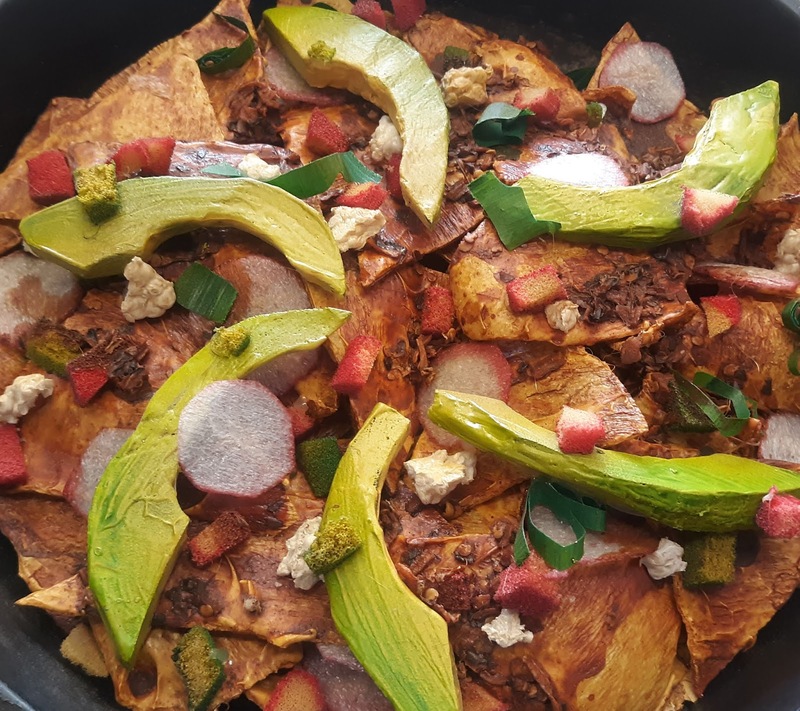 It's time for another guest #fakefoodfriday post! 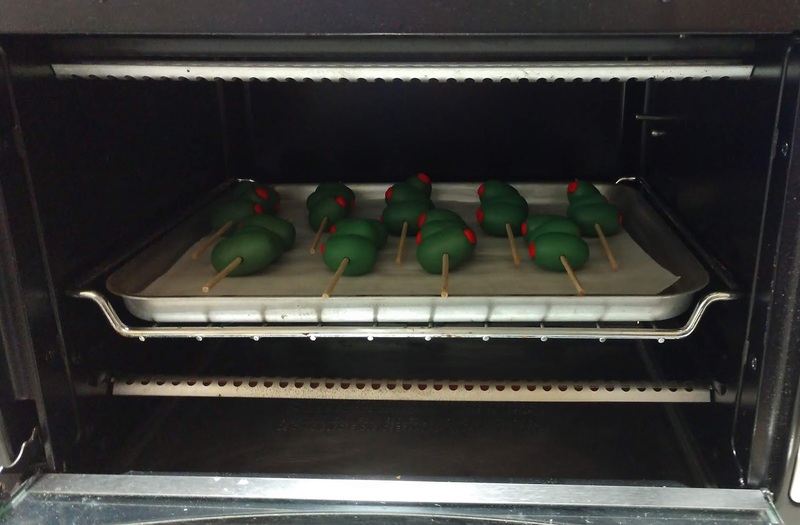 This time we have some delicious looking kolaches and Pastel de Guavas from Jenn Higgins, who is an artisan at Milwaukee Repertory Theatre in Milwaukee, WI (aka where our dear founder Anna was working when she started this blog!). For Milwaukee Rep’s production of “One House Over”, the actor was going to consume one kolache from a box of them. To create my kolache, I cut a piece of craft felt, and used spray adhesive to attach a thin layer of natural cotton batting. This helped the felt have a thicker and more pastry like texture. Next I painted a latex and acrylic paint mixture over the batting. I repeated these steps for the interior corners not covered by the “filling” (carved and painted pink foam). A little extra acrylic paint, some hot glue to hold them together, and a sprinkle of corn starch baby powder for a powdered sugar look and they were stage ready! These are Pastel de Guavas made for the Milwaukee Rep’s production of “In The Heights”, made of carved upholstery foam, then covered in batting and latex in a similar fashion! Thanks for the tips, Jenn! The cotton batting is such a great pastry texture! Do I need to go out and get some pastries tomorrow? That would be a hard yes. Happy FFFriday everyone! Pink foam. Foam board. Blue Foam. Rigid Foam. Foamular. That stuff with the Pink Panther on it. 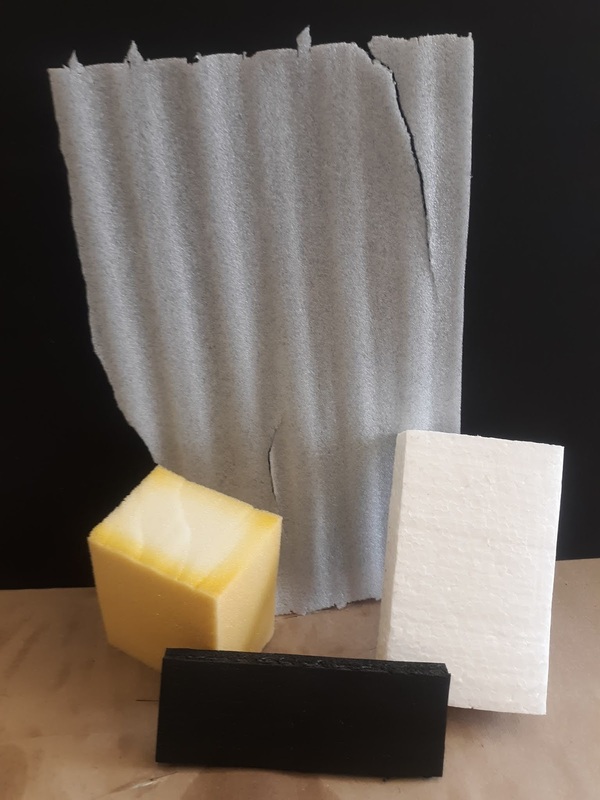 Insulation foam has a lot of names and even more applications! Upholstery, bead, or insulation foams are standard base for a lot of fake food, but choosing what kind really depends on the project you're working on. We will explore all of them eventually, but first: insulation! 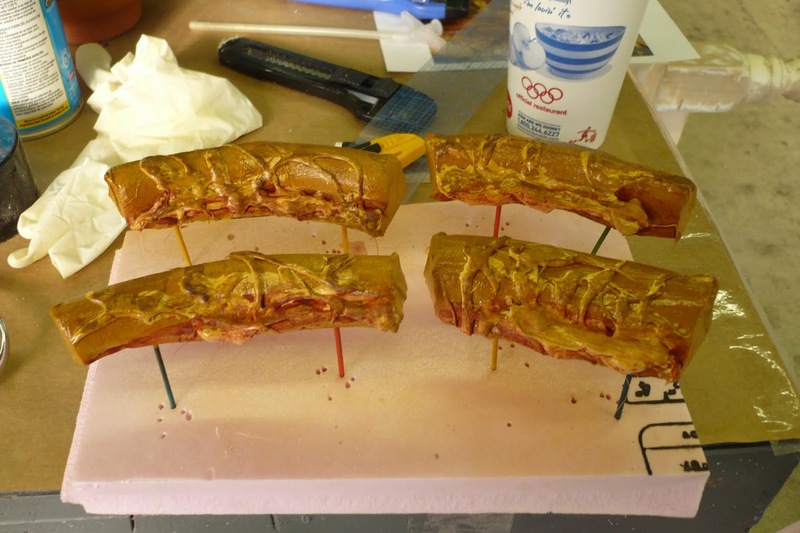 Insulation foam has been featured in a few posts on the blog: Cakes ala David, Cheesecake and most notably, Fauxsciutto! Building:Insulation foam is a great choice for stability, as it doesn't break apart like most bead foams. You can find it in several sheet sizes and thicknesses which gives it a lot of versatility. For large projects, insulation foam can be stacked (laminated) together, as you can see in the picture above. Where it really excels is detail. 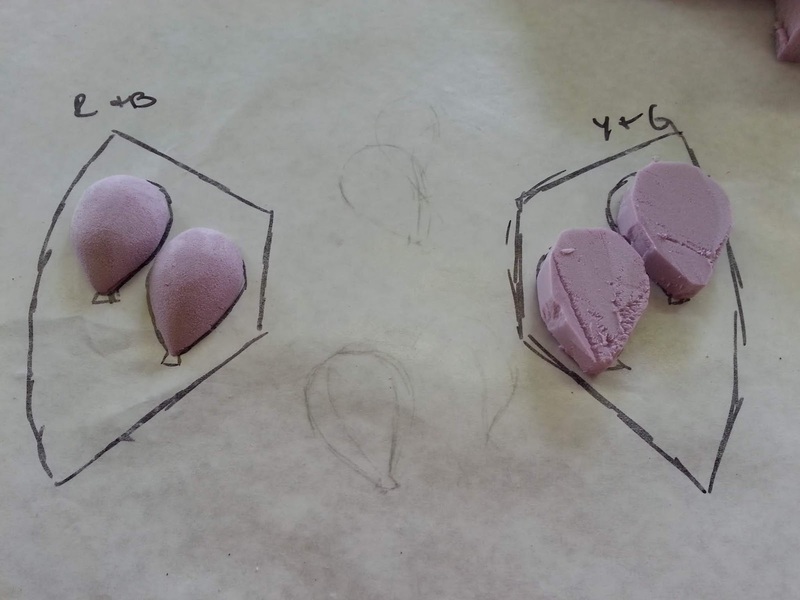 Carving shapes into pink foam will hold edges and designs. Carving swirls into these cinnamon buns was very easy with an Xacto knife. Insulation foam also sands easily and evenly (unless you have a lamination line, and then it can get a bit tricky...). Like bead foam, insulation foam is a great material to use as a false bottom or a firm filler. I used insulation foam here because I needed to carve a hole for the spoon and I was worried bead foam wouldn't be able to hold the weight. 3M FastBond Contact Adhesive 30NF is an excellent choice for laminating sheets of foam for large projects. It comes in tan or green, and it's a low VOC formula. It doesn't smell awful, but, as with all adhesives, should be used in a ventilated area. Safety first, y'all! Unfortunately FastBond isn't the easiest to get, but DAP Weldwood Nonflammable Contact Cement is a safe bet. It's carried at the big hardware stores in small quantities, so if you're a freelancer or small shop, it's a great choice. Both can be rolled on with a paint roller for large sheet lamination, or an old chip brush works just as well! Side note: I once worked in a terrible fabrication shop that ran out of green glue, opted to use spray adhesive INSIDE, then when that ran out, decided that wood glue would work, "just fine" to laminate several 2'x4' sheets together into a huge tower. Shockingly it didn't work and I didn't go back. Finishing/ Paint Prep: This all depends your final goal, but there are several ways to seal coat your foam. A pricey and sturdy route is Rosco Foamcoat. It will give your piece a hard shell, which is good if you think it's going to get handled roughly, which is why I used it for the Cheesecake. Aqua-Resin is a liquid & powder composite resin that gets very hard when cured. It's also pricey, but I know some carpenters swear by it. It's likely a bit overkill for fake food, but who knows what we might need a cake to do? For a lighter touch, a coat of thinned out Flex Glue and cheesecloth or tissue paper will give your foam a paintable surface. Don't want to spend $60 on a jug of Flex Glue? 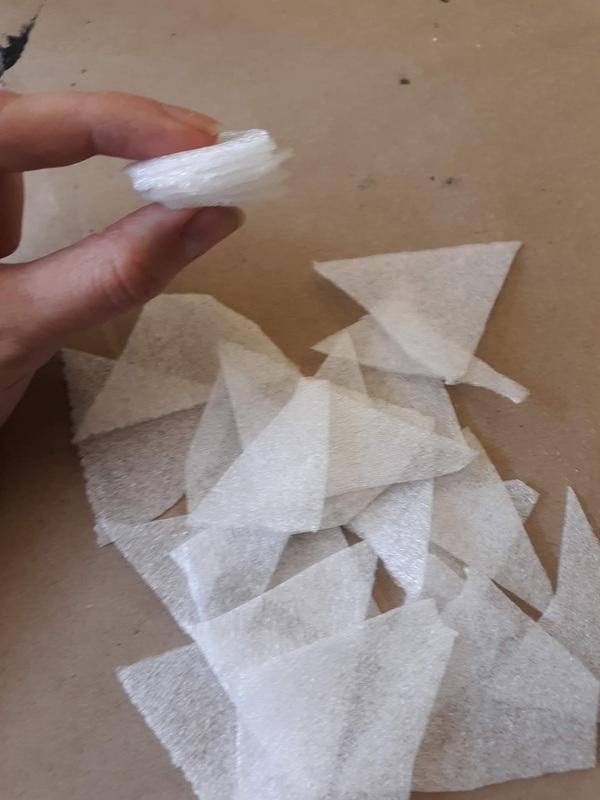 Regular white glue will work, it's just less flexible when dry. I have definitely used unthinned bottles of white glue from the Dollar Tree because when your budget is only $350 every little bit helps. You can also get a package of tissue paper from Dollar Tree, because they're a freelance prop artisan's best friend. Straight paint: I don't suggest this, but sometimes you've just gotta do what you must. 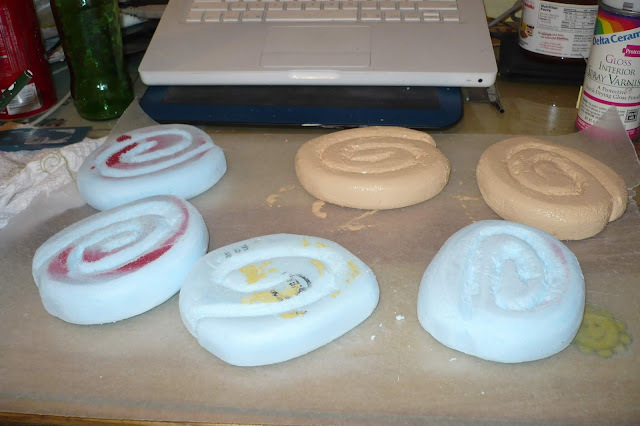 Those ugly cinnamon buns from earlier were painted without any coating, using acrylic paint. It stuck okay, but they were only display items, and you could see all of my sanding and carving flaws up close. Thankfully they were under glass and upstage, but I would definitely do it differently if I had to make them now. A note about spray paint: if you do not seal your foam in any way, spray paint will eat away at it. Design Master Floral Sprays are less destructive, but if sprayed too thickly will still degrade your foam. This could be used as a distressing technique, but if you do that, please, please be in a very well ventilated area and wear a respirator. Foam melting releases all sorts of awful things that are VERY BAD for you. Insulation foam scrap also makes a handy stand when you don't want your item sitting on a surface. These crusts are made from 1.5" pink foam, covered in flex glue and muslin (I was on a time crunch and we didn't have cheese cloth or tissue paper, the horror!) with some hot glue cheese and red paint sauce. What other materials would you like detailed on a Materials Monday? Send me an email at fakebakeprops@gmail.com or leave a comment below! What's cute, sweet, and a little prickly? 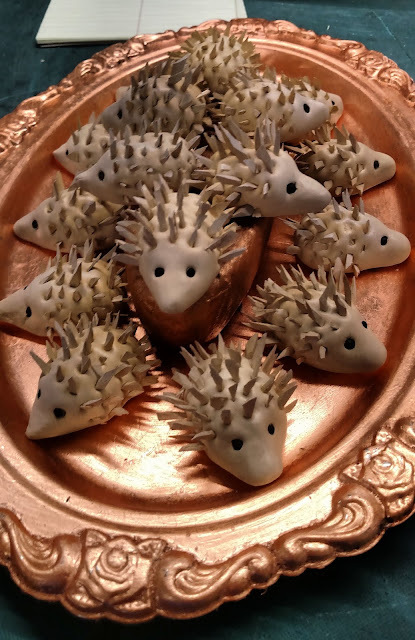 Marzipan hedgehogs! 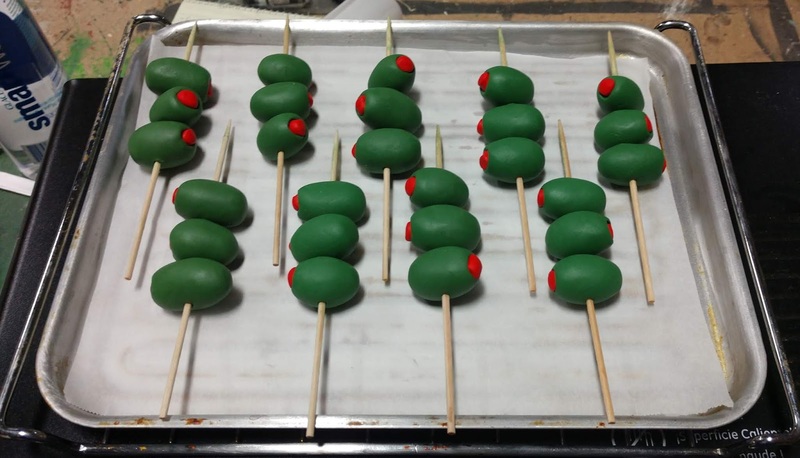 For this week's Fake Food Friday, I'm going to talk about these faux-zipan treats made for a production of Don Giovanni at the Santa Fe Opera. The show was set in the mid 1600s and there is a big banquet scene. We opted for mostly desserts and finger foods. Many of which I'll probably be posting for future FFFridays. If this little guy looks familiar, it's because his brother is our current Instagram icon! 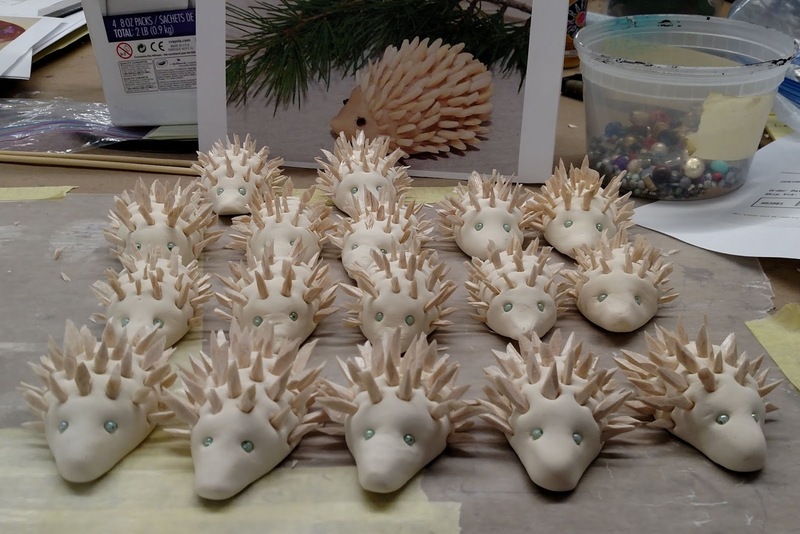 I'm pretty partial to these because they're just so darn cute and spiky. I found this super cute research picture on a gluten-free recipe blog and figured they'd be pretty easy to recreate, and barring some weird noses, they were! I opted for Crayola Model Magic for several reasons. You can find it at practically every craft store, it comes in big tubs, and it's very affordable. It also dries very quickly, and if you're in the desert like I was, it dries MEGA FAST. For those who haven't used it, Model Magic is a light, air-dry clay. Michaels used to have it's own version of MM, which I've also had success with. I usually opt for the white, because you can mix acrylic paint into it. (If you add too much, it can get suuuper sticky...) It's very easy to use, you just pull it out of the bag and it's ready to go. Always put unused material in an airtight container because it WILL dry out. 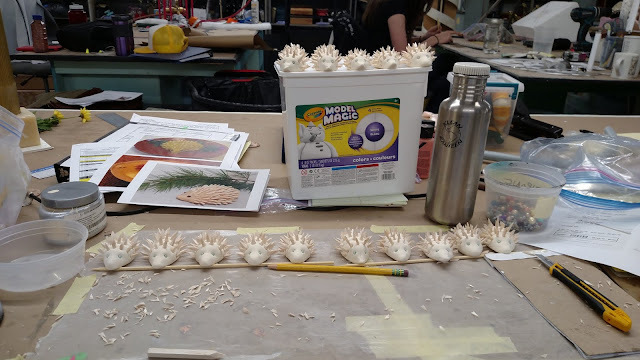 Once they were dry and spiked, they were ready to hand over to paints! In hind sight, I probably should have glued some of the looser spines in, but for the most part they stayed in pretty well. That's all for this week's FFFriday! Submit Your Fake Food Friday How-To Idea! The Dagwood of Your Dreams! Food Styling for Radio- Wait, what?